Gaithersburg, Md., Dec. 18, 2008 – Juliet W. Reid, of Washington, D.C., was elected President of the Washington International Horse Show (WIHS), a leading international equestrian competition, at the December meeting of the Board of Directors. Now in its 51st year, the WIHS is held annually at Verizon Center in Washington, D.C.
"I am honored to be elected President of this 50-year-old Washington institution. The WIHS holds the distinction of being the last of the classic, major metropolitan horse shows in the U.S. and the pinnacle of the equestrian calendar. We are committed to the survival of this historic horse show and have a huge task before us. I am confident that we have the strong, committed Board and the team assembled that is necessary to make that happen,” said Reid. Newly elected to the Board were Georgina Bloomberg, of New York, N.Y., and Victoria Lowell, of Brookeville, Md. Bloomberg is a leading equestrian competing in national and international show jumping events. Lowell is Senior Vice President of Marketing for Animal Planet Media, where she helped consult on production of the Animal Planet equestrian programming—HorsePower: Road to the Maclay, the Animal Planet Sporthorse Cup and the World Sporthorse Championships series. Lowell is a lifelong equestrian and rides as an amateur in the jumper divisions. At the Board meeting, Ken Cort, of Potomac, Md., was re-elected Vice President and Kirsten Pollin of Washington, D.C. was re-elected Secretary. Anne Poulson, also of Washington, D.C., was elected Treasurer. Outgoing President, Jorge Carnicero, McLean, Va., will serve as Chairman. Reid first joined the WIHS Board in 2007 and was elected Treasurer in 2008. "I am committed to helping the WIHS get a solid foothold even in this time of financial uncertainty," said Reid. "WIHS is vital to the equestrian industry and is a proving ground for young riders, who will form our future Olympic, Pan American and world championship teams. I would like to see it reach its full potential." Born in Ocala, Fl., and raised in New York City, Reid was exposed to horses as a child but the love and dedication to equestrian sport came later when she began to travel on the equestrian show circuit with her daughter, Chloe, a nationally ranked rider. After years of attending these shows, Reid made it her goal to give back to the sport that gives so much to her daughter who loves it so dearly. The sport also has been a family tradition. Reid’s mother, Charlotte Weber, is a leading thoroughbred breeder, trainer and owner. Her brother, Chester Weber, is a member of the U.S. Equestrian Team and six-time U.S. National Champion in Four in Hand Combined Driving. In addition, she sits on the board of Live Oak Foundation, which supports equestrian sport. Reid is a graduate of Brown University. She and her husband, Sam, and their two children live in Washington, D.C.
An equestrian tradition since 1958, the Washington International Horse Show brings top horses and riders from the U.S. and abroad, including Olympic champions, to the nation's capital to compete for more than $400,000 in prize money and championship titles. About 500 horses participate in show jumping, hunters, equitation and dressage events during the six-day show. Special exhibitions, unique shopping in 55 boutiques and a Pony Pavilion with free pony rides round out this family-friendly show. Since its debut, the Washington International has been a popular Washington, D.C. fixture visited by presidents, first ladies, celebrities, business and military leaders, as well as countless horse enthusiasts of all ages. 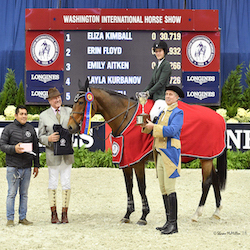 The Washington International Horse Show Association, Ltd. is a 501(c)(3) non-profit organization. For more information, visit http://www.wihs.org. The 51st WIHS will be held October 20-25, 2009.